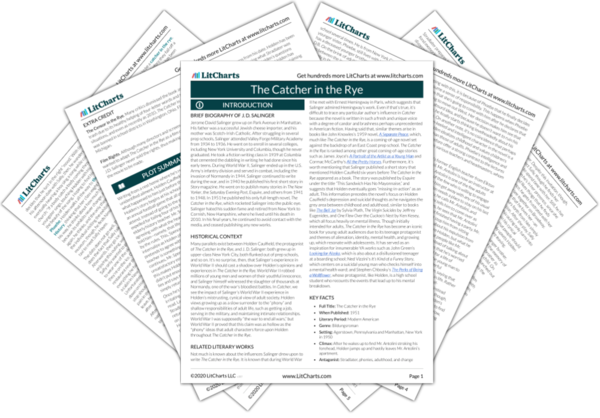 Instant downloads of all 942 LitChart PDFs (including The Catcher in the Rye). 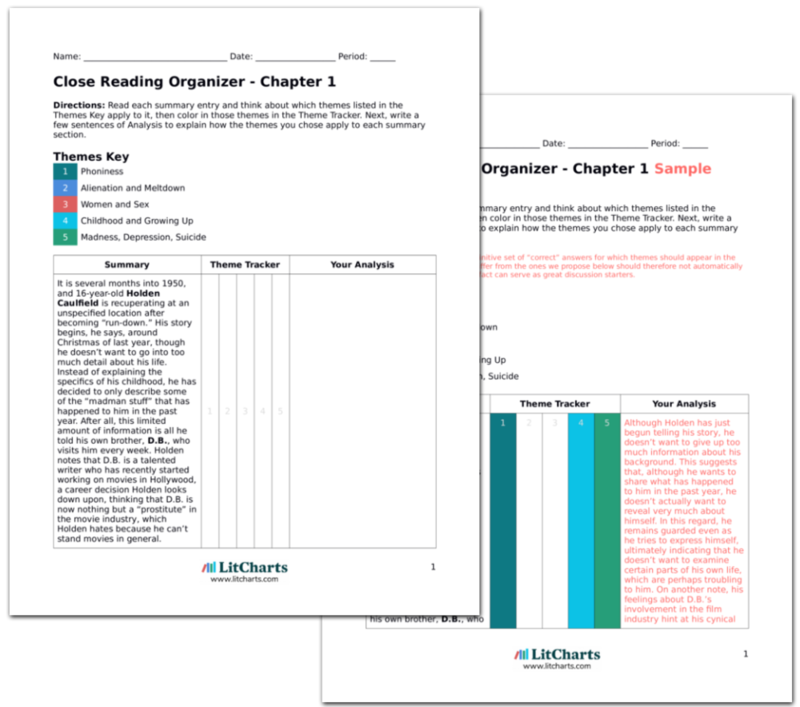 LitCharts assigns a color and icon to each theme in The Catcher in the Rye, which you can use to track the themes throughout the work. Mr. Spencer's house makes Holden depressed. It's smell and appearance reminds him of old age. Holden finds "old age" and adulthood repulsive. Mr. Spencer greets him warmly, and they start to talk. At one point, Mr. Spencer tells Holden to heed Dr. Thurmer's advice that life is a game that must be played by the rules. Holden agrees, but privately comments that life is really only a game for people on the winning side. Holden rejects the rules imposed by society and adulthood because he feels like an outsider. He feels like he isn't on the "winning side." Mr. Spencer's warmth implies Holden is a good kid, though. Mr. Spencer next comments that he once met with Holden's parents, who are "grand" people, which strikes Holden as a "phony" word. Mr. Spencer continues to lecture him, reminding Holden that he failed history because he knew nothing and wrote an atrocious essay on the Egyptians. He even reads the essay to Holden. Holden doesn't apply himself because he doesn't value the things that academic success brings. If the adult world is phony, then academic success will just bring him into that phony world. Eventually, Holden begins to tune out, and wonders to himself where the ducks in the Central Park lagoon go during winter. Holden's wandering mind is like a child's. His focus on the ducks will become significant later. 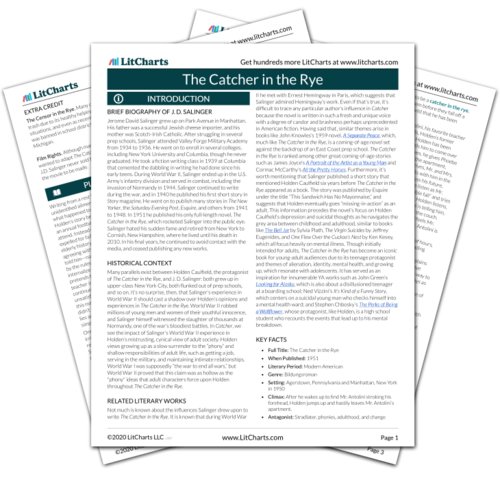 Get the entire The Catcher in the Rye LitChart as a printable PDF. Mr. Spencer asks why Holden failed out of two other prep schools (Whooton and Elkton Hills). Thinking Spencer wouldn't understand, Holden tells him only that it's a long story. But privately he says he wanted out of Elkton Hills because he was "surrounded by phonies," especially the headmaster who only gave his time to the wealthier, better-looking parents. Holden often seems selfish, but his reasons for disliking Elkton Hills are sensitive and astute. His description of the principal currying favor from the richer, prettier parents is totally believable. Phoniness is real, and Holden can spot it. When Mr. Spencer encourages Holden to plan for the future, Holden has had enough. He assures Spencer he's just going through a phase, and stands to leave. On his way out, Mr. Spencer wishes him "good luck," an expression Holden hates. Holden doesn't want to plan for the future. In fact, he doesn't want there to be a future, because in the future he'll be an adult and he thinks adults are phony. Kestler, Justin. "The Catcher in the Rye Chapter 2." LitCharts. LitCharts LLC, 22 Jul 2013. Web. 9 Nov 2018. Kestler, Justin. "The Catcher in the Rye Chapter 2." LitCharts LLC, July 22, 2013. Retrieved November 9, 2018. https://www.litcharts.com/lit/the-catcher-in-the-rye/chapter-2.